Here you will find information on relocating to Scottsdale, Arizona. Scottsdale is located just east of Phoenix in the Beautiful Sonoran Desert and is continually rated as one of the most desirable places to live and visit. Scottsdale's beautiful scenery, irrigated desert location and favorable climate influenced its initial settlement by United States Army Chaplian Winfield Scott in 1888. In it's early years there were ranching operations that later inspired the "West's Most Western Town" which today is the town's slogan. Love the outdoors? Scottsdale is bordered by the Tonto National Forest and you can explore the McDowell Mountain Regional Park with over 50 miles of muli-use trails and spectacular view of the surrounding mountain ranges. A visit to the park may allow you to see abundant birds, coyotes, deer and javelina all on over 21,000 scenic acres. Golf on one of the championship courses, their are over 200 in and around the Scottsdale area. You can watch MLB spring training game, go Salt River rafting, or climb or hike in one of the mountain parks. There are lakes nearby for swimming, fishing and boating. Scottsdale has a great selection of city parks, libraries, pools and community centers to meet many of your leisure activities. Scottsdale is bursting with unique attractions to fill your days and nights. Enjoy one of the many museums, art exhibits, collector car auctions, major horse shows, rodeos and the eclectic downtown districts that serve up the bustle and sophistication which you may desire including more than 90 restaurants, 320 retail shops and more than 80 art galleries. Thinking of moving to Scottsdale? Have questions? We can help? 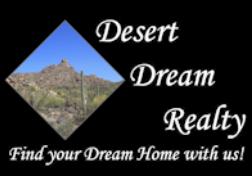 Contact us using the form below or call Desert Dream Realty at 480-252-8300. Find your Dream Home with us! If you are buying a home in the area, Check out this section for our buyers. If you need to sell your home in our area, check out this section for sellers.